As part of the Stepping Up video series, we asked people passing by on the street different questions around the topic of manhood. In this clip, we asked them, “When do you think a boy becomes a man?” There were some interesting responses; many had difficulty answering the question. It’s interesting that this verse follows a very famous passage of Scripture, oft-quoted at weddings … the “love chapter” of 1 Corinthians 13. I have been at many marriage ceremonies where this passage was read but never one where they read this verse (which follows directly after the “love is” verses). Maybe if more marriage ceremonies included this verse there might be more attention drawn to becoming a man and turning away from childish things. Raising a Modern Day Knight, by Robert Lewis (book and video series). Rite of Passage, by Jim McBride (executive producer of Sherwood Pictures films such as Fireproof and Courageous). If you are aware of any others that are biblically based and have made an impact on you or someone you know, share them here. So when does a boy become a man? Is there a specific time when YOU consciously put away childish things? Men help men grow up. Read Dave Boehi’s article, “Men Who Won’t Grow Up,” on FamilyLife.com. Seriously consider organizing a Stepping Up 10-week study so together you can grow as men in godliness. 1 Corinthians 16:13-14 is a passage that’s always intrigued me. If ever there was a passage designed specifically for guys, this would have to be it. What more could a guy ask for? Two verses. Straight to the point. Five very short, direct commands. Recently, I had been digging into the passage, trying to plumb the depth of truth in those two verses in the original language. I thought it would be quick, but there’s so much there, I ended up having to put it aside for when I had more uninterrupted study time. Before I could get back to it, wouldn’t you know it, FamilyLife Today had a radio broadcast on that very passage. If you’ve ever seen the Stepping Up video series, you may remember James MacDonald giving a quick, to-the-point, teaching session on this passage. If you haven’t seen it, here it is. On the FamilyLife Today broadcast, however, he dives deeper as he talks to a group of men at his home church in Chicago, Harvest Bible Chapel. I’ve excerpted a few pieces here to whet your appetite so you’ll listen to both days of the broadcast. We have to act like men, and the first part of that is to “be watchful.” It’s the idea of—in old times, there were these ancient cities that were surrounded by walls. The men had the responsibility to keep the barbarians out. In the fortified city, the people (in this instance: your wife, your children, your family) could only rest because they knew that the watchman was awake and was on the wall. It’s time for us to quit being so passive, and step up—as we’re being challenged today—and do something! God help us to be watchful over our homes! Act like a man! Hang up the phone, get off the couch, shut off your computers, stop tinkering in the garage; and act like a man! Your son needs you / your daughter needs you. So be watchful. Of course, in Scripture, Christ is our strength. This isn’t an exhortation to try harder. Do you hear me? This is not an exhortation to try harder! “I can do all things through Christ who strengthens me. [Philippians 4:13]” Jesus Christ is the strength to live the Christian life! It’s not like He stands over there—“Thank You for saving me. Now watch me go live an awesome life for You,”—alright? “As you received the Lord, so walk in Him…[Colossians 2:6]” Christ is the way to salvation / Christ is the strength to live the Christian life. You just finished reading the post, “What it means to ‘act like men'” on the Stepping Up blog for guys. Write the passage down and put it in a prominent place at home or work, then commit it to memory. To go even deeper, read James MacDonald’s book, Act Like Men: 40 Days to Biblical Manhood. Get with a group of other men to go through the 10-week video study, Stepping Up: A Call to Courageous Manhood. Men are back in vogue. At least they are today on the 11th anniversary of the September 11 attack. Fourteen years ago, a lot of everyday guys became instant heroes. They didn’t set off that day to be heroes, they just responded with courage in the flash of a moment on a day that was anything but everyday. Some of those guys, like the first responders in New York City, were trained to do heroic things. They thought of their actions that day as nothing more than just doing their jobs. Other men were military personnel, but not the heroic kind on the front lines of battle. These were guys who had desk jobs, whose heroism was thrust on them when the Pentagon came under siege. Other guys were just businessmen who were flying as part of their job, until their job became confronting the face of evil in the skies over Pennsylvania. In every instance, each man stepped up by putting aside his fear and personal safety for the well-being of those around him. Wall Street Journal columnist Peggy Noonan wrote about these men in a column a few days after the 9/11 attacks. It wasn’t specific men she was writing about, but the innate character of men that may hide itself in times of safety, but shows itself the most heroic in the face of catastrophe. You didn’t have to be a fireman to be one of the manly men of Sept. 11. Those businessmen on flight 93, which was supposed to hit Washington, the businessmen who didn’t live by their hands or their backs but who found out what was happening to their country, said goodbye to the people they loved, snapped the cell phone shut and said, “Let’s roll.” Those were tough men, the ones who forced that plane down in Pennsylvania. They were tough, brave guys. It’s easy to venerate these guys when you see what they did on September 11, 2001. But would we have felt the same way about them on September 10? No, we probably wouldn’t have even noticed them. Even the firefighters. One segment of the Stepping Up video series features these members of the New York Fire Department. Just looking at these guys on the video and hearing them talk, there doesn’t seem to be anything special about them. Truth is, though, there was no difference between the ones who came home and the ones who didn’t. Both groups showed courage. Both stepped up. Both were heroes, it’s just easier to recognize it in the ones whose heroism took the form of the ultimate sacrifice. It doesn’t take a 9/11 to be a hero or even to do courageous things. It’s only the circumstances that bring it out. These firefighters probably showed the same courage on the 10th and 12th as they did on 9/11. And there are other men around the country that we will never know about who showed just as much courage on those days. “Courage is not the absence of fear, but rather the judgment that something else is more important,” said Ambrose Redmoon. So whether your actions earn you the title of hero or whether they’re never even noticed at all, do the things that a man does: stand for righteousness, live for others, and keep the big picture in focus. Remember that today’s everyday man is often tomorrow’s hero. You just finished reading the post “Men are back, at least for today” on the Stepping Up blog for men. For Brian and Mel Birdwell, the heroics began after the 9/11 attack on the Pentagon. Listen to the broadcasts. Grab a group of guys to explore together the Stepping Up video series and what makes up courageous manhood. When we launched the Stepping Up video series a few years ago, we had no idea what a huge impact it would make on men in homeless shelters and in prisons. Many of these men grew up not knowing what it meant to be a man, and they found themselves in hard places as adults. That’s the reason Stepping Up is making such an impact on these guys. For the first time in their lives, they’re getting a road map to manhood, and the results will make a difference for the generation coming after them. We recently received a letter from Lynden, who’s serving time at a federal low security facility in the Northeast. Lynden gets it. Not only are the Stepping Up principles changing his life, they’re getting him excited about helping other men change their legacies. This is something to get excited about. Please pray for Lynden and men like him who are Stepping Up! I’ve just completed the Stepping Up course here at [the correctional facility]. I found the course to be very helpful in showing me the extreme importance of having men in our lives to provide us with real-life examples of how life should be done. It also caused me to “look back” on my own life at how I was failed by the men in my life and, in turn, how I failed to provide the real-life example for my step-son. I have great remorse about my actions as a father and step-father and now I am seeing the fruits of my own failures. My step-son, now 19, dropped out of high school and now has a pregnant girlfriend. They are having the baby and will be getting married, but I can see that my lack of leadership is a direct contribution to his situation. I sure would like to have that opportunity back, but we get one shot to get it right. I’m not saying that I would have to be perfect, just a good father that makes mostly good decisions. I made many more poor decisions than good ones. I turned my back on God and embraced atheism for four years. My step-son wants no contact with me and he has no older males in his life. I fear for him. He is not saved and was raised in a semi-active LDS home. While I know there are no “do-overs” in life, I look ahead to what the Lord has in store for me. I’m blooming where I’m planted through demonstration and proclamation of Jesus Christ. While I find it somewhat difficult to apply the principles of mentorship here in prison, I take the content of the Stepping Up course and try to apply it to my life. My vision for the future is to start a post-prison re-entry program. The name will be 491 More Second Chances. The ministry will help men through apprenticeship and journeyman programs in construction, plumbing, electrical, renewal energy, HVAC, food service, welding, machining, and carpentry. My first wife and I plan to remarry and pursue this endeavor together with Christ at the focal point. We want to provide free counseling and support groups for the men and their families. We’re looking to reconnect these men to their families, themselves, and most importantly, to introduce them to the King of Kings. We both know this will be a huge task, but with God all things are possible. We’ve got a plan and we’re excited to see how the Lord is going to lay out the path before us. I’ve done too much “self-service” and I’m now serving the Lord in my life. I wish I would have known how awesome it is to be an obedient, honest, and trustworthy man of God years ago … but I didn’t. I do now and I’m not looking back, now that my hands are firmly holding to the Gospel plow! Thank you for Stepping Up and FamilyLife. © 2015 by FamilyLife. All rights reserved. Letter used with permission. You just read, “Second chance manhood” about how Stepping Up is changing lost lives and legacies. More kids and young men today are experiencing “Father Hunger.” How can you satisfy your kids’ need? You can host Stepping Up in prison or homeless ministry in your area. Or you can help others get one started. Barry “Butch” Wilmore is captain of the International Space Station, where he’s spending several months conducting experiments, doing repairs, and increasing the capabilities of the station. One of the other interesting things Wilmore did was to finish a personal study of the Stepping Up men’s material, which he found to be both empowering and challenging in his personal life. Wilmore recently talked with FamilyLife Today hosts Dennis Rainey and Bob Lepine about his time in the space station, focusing mostly on spiritual matters, like his mentoring ministry, his role as a father and daily experiencing the awesome creation of his Heavenly Father. This is an excerpt of the transcript from the February 6 broadcast. Click the link, “Life Aboard the Space Station,” If you want to hear the entire broadcast. Dennis Rainey: Captain Wilmore, you have done a number of deployments in your service for the Navy. 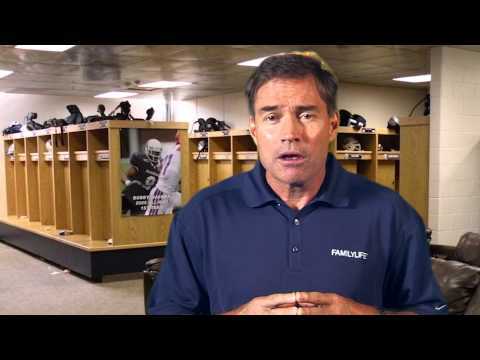 You have any coaching for dads who travel a lot? Maybe, they don’t go to outer space, but they’re gone three or four days a week or a good number of days throughout the month—any coaching for them about caring for their wives and their children in the midst of that? Barry Wilmore: I think the thing that I would say from my standpoint—and what I’ve tried to do myself—is always think about biblical principles—you know, raise them in the nurture and admonition of the Lord and teach them God’s Word. That’s what I do with my daughters, and that’s what my wife and I do together. Dennis: So, that’s a setup. Do you want to say anything to those girls of yours?—any words from Daddy to a daughter? I know you get to talk to them too, but here is a chance to both brag on them and exhort them with a few hundred thousand, if not a million, listeners across the country. Dennis: Well said by a dad. Way to go! Is there a question you’d like to be asked that’s a favorite question for you to answer? —and to glorify Him—and that’s the main driver. So, that would be the question: “What drives you?” and that’s the answer. Bob Lepine: You have time in your schedule to include spiritual disciplines and to keep your spiritual self in shape, right? Bob: So, what are you doing in space—I know you have an opportunity to read your Bible, and you mentioned reviewing messages from church. Anything else that you are doing to just stay connected to Christ? Barry: The Lord gave me something a few years ago that I have been continuing. It wasn’t something I set out to do—it just kind of happened—and that is that I started sending out a devotion to just a couple of people daily / every single day. Over the years, the Lord grew that distribution list. I don’t know how many people are on it now—I haven’t counted—it’s probably 70 or so different emails that I send out. So, I do that every day—preparing the devotion to send out to those 70 individuals. Also, I have it posted on my friends and family website. So that, right there, is something that the Lord has given me to keep me in His Word, and keep me studying, and keep me growing—and for that, I am grateful. Dennis: I just want our listeners to think about where Butch is right now because he’s looking at how this verse is really spelled out—Psalm 8. O Lord, our Lord, how majestic is Your name in all the earth. You have set Your glory above the heavens! When I look at the heavens, the work of Your fingers, the moon and the stars, which You have set in place; what is man, that You are mindful of him and the son of man that You care for him? Barry: I can tell you from this vantage point, “majestic,” indeed—praise Him. Bob: Butch, let me ask you one more question. How often does the sun come up during the day, and how often does it go down during the day for you? Barry: Oh, there is another blessing! The sunrises and sunsets here are just amazing. The Space Station—the whole station for about six to ten seconds turns completely orange as it goes through—as the light passes through the atmosphere. It kind of acts as a prism and separates the colors. I get 16 of those a day—fantastic! Bob: So, is it almost bedtime for you now? Dennis: Well, Butch, thanks for joining us on FamilyLife Today. Just want you to know it’s no excuse that you can’t listen to the broadcast up there. You should have figured that out in advance, but we’ll forgive you for that; okay? You finished reading the post “Stepping Up in space” in the Stepping Up men’s blog from FamilyLife. What do you picture as you read the words of Psalm 8 about God’s creation and the special place He has given you? Listen to Barry Wilmore on FamilyLife Today from the February 6 broadcast and the December 22 broadcast. Who could you get to join you to go through Stepping Up as a small group? Pray about it, then go for launch. When Dennis Rainey wrote the book Stepping Up and when FamilyLife created the 10-week video series, everyone had the idea that it would impact men. But no one had any clue how God would choose to use these resources to impact the very young and guys many would consider the throwaways of society. The men behind bars. I thought it was phenomenal when my son’s Boy Scout troop went through the series as a father-son activity. I was blown away seeing how hungry these young men, even boys, were to hear the message of what it means to be a man. Even at their young age they grasped it; they grasped for it. Unlike many of us grown men, they may be spared the years of struggling and failing in their quest for authentic manhood. Recently, I saw an even more remarkable story of transformation. A group of men behind bars at the Wrightsville Correctional Facility in Arkansas went through the 10-week Stepping Up study. Most of these men didn’t have good male role models growing up, if any at all. God met them in a powerful way through the study to draw them to Himself and to help them get a glimpse of who He created them to be. Their testimonies are powerful. “I think men in prison are hungry to become real men. Maybe more so than men in the church, because they recognize how they’ve failed. Watch this incredible video, and see if God gives you a vision of how to use Stepping Up in creative and impactful ways. 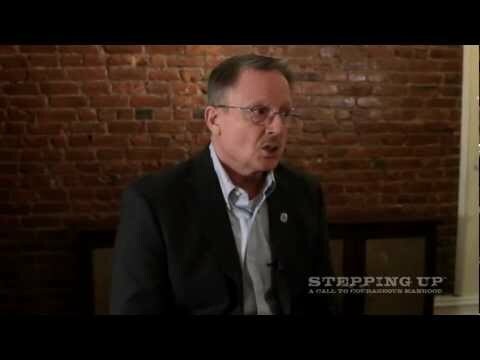 Hopefully, you watched the video, “Stepping Up As a Prison Ministry,“ taken from the Stepping Up website. Have you done the Stepping Up video series in a creative or unusual setting? Please comment to tell us about it! 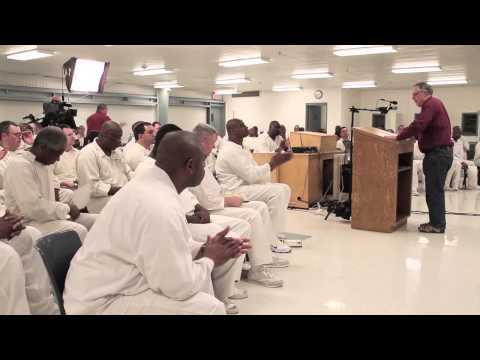 You can host Stepping Up as a prison ministry in your area. Or you can help others get one started. Truett Cathy is the father of the chicken sandwich and a man who set the bar for other fast food empires. On Monday, September 8, he left this world, and the restaurant kingdom he built, to go home to a better kingdom and be with his Heavenly Father. Cathy invested his life in others. Nowhere is that more evident than through the testimony of his sons, Dan and Bubba, who carried on his values at home and in the corporation they manage. Watch this segment from the Stepping Up video series. It was created to be a representation of what it means to be a patriarch. With Truett Cathy’s passing, it is a testimony to a life well-lived. Truett Cathy was a patriarch. Not just of the chicken sandwich or Chick-fil-A, but in the more traditional sense of the word—in the best sense. He was married to Jeanette for 65 years. He passed on his business and family legacy to his two sons and one daughter. He taught adolescent boys’ Sunday School for 50 years because he knew the importance of older men investing in the lives of younger men. Listen to a special broadcast of FamilyLife Today, “Truett Cathy: A Life Well-Lived,” which features an interview that Dennis Rainey and Bob Lepine did several years ago with this patriarch. 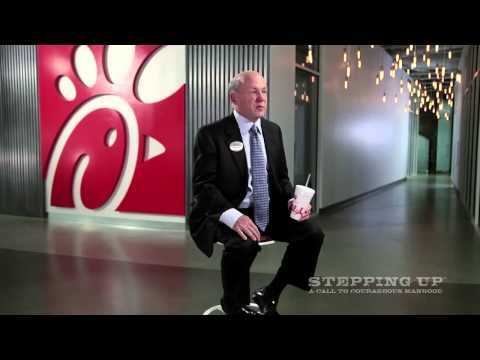 You just read the post, “Truett Cathy: Patriarch of more than the chicken sandwich” on the Stepping Up blog. What kind of legacy was left to you? What kind of legacy will you pass on to your children and to this world? Dennis Rainey wrote an article “Remembering Truett Cathy” which includes his personal reflections. If you appreciate the legacy of Truett Cathy, share the blog post, video, or broadcast with a friend.